How did SWI at Nueva start? Matt started things in his own classroom and then in 2011 made my first trip to Nueva as I was invited to speak at the Innovative Learning Conference (ILC) they host every other year. In 2013, I spoke at the next ILC, but this time I stayed for a week to work with teachers and students in and out of classrooms and a two day workshop on the following weekend. That was the year things started to really change. Emily Kolatch, the head Lower School had a remarkably quick understanding of the implications of what I was sharing. She made it clear on that visit that she was going to do whatever she could to make SWI drive instruction at Nueva. While Nueva was getting interested in SWI, I was extremely optimistic about the fertile ground Nueva was offering SWI. The culture of learning here was special. Design Thinking was something that embedded inquiry in the culture from the start in a powerful way. With time I came to understand what I think is a powerful relationship between SWI and Design thinking. SWI is scientific inquiry of the trails of meaning traced by the oral and written word. Design thinking is about using a scientific approach to creating new solutions to resolve perceived problems. Both are based on scientific inquiry, but in different directions. Structured word inquiry is about using scientific inquiry to uncover a path that already exists. Design thinking is about using scientific inquiry to build a path that does not yet exist. I’m convinced that these dual experiences of inquiry feed each other well. Eventually, my friend and colleague, Gail Venable was invited to take a half time position as a kind of “Real Spelling Coach” for the teachers. Now the learning really took off. And when Gail announced her retirement to focus on grandma duties, I was offered the full time “scholar in residence” position for a year to build on the learning that had taken place. In the meantime, with each visit and public workshop the wider community of educators has grown like no other location. It is an exciting time for instruction of the written word in the Bay Area. 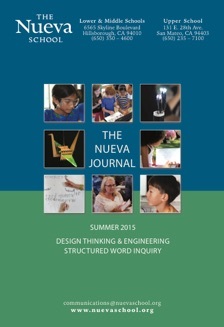 I encourage you to explore the excellent articles to learn more about SWI and the Nueva School. With Nueva’s permission, I am sharing the digital forms of their articles on SWI. These pieces were not written by me, so they offer an excellent perspective on SWI from a school that has taken on this work comprehensively.